If shoppers don’t know about your promotions, they miss out on a good deal and you lose sales. That’s no good for either you or them … which is why, as a retailer, you should be using Sly Fox Shopper. Sly Fox Shopper is an app that sends details of your offers direct to the phone of potential customers, all looking for retail deals like yours. That means you can reach them not just when they’re planning to shop, but when they actually are. No more having to wait for someone to pass your door to get your promotion noticed. > By alerting shoppers to your promotions, you will help increase footfall in your store, and more people in your shop means more business. > Sly Fox Shopper will introduce you to a whole new market of potential buyers who don’t know about you or what you have to offer. At Sly Fox Shopper we make sure your promotions get noticed, whatever kind of retail you’re in. > Your promotions will go live in under an hour. This makes Sly Fox Shopper the perfect promotional vehicle for flash sales, as well as for longer-term marketing. > You only pay for as long as your promotion is running, and the longer the promotion, the lower the daily charge. With Sly Fox Shopper it’s easy to change and amend your promotions so you can test, revise and refine your promotions so that you’re getting the most out of them. Not only is Sly Fox Shopper a cheaper way to promote your business than using Google or local newspapers, but right now we’re offering some of our best rates ever. On top of this we’ll also give you an initial credit you can use at any time and on any of your promotions to reduce their cost or even make them completely free. It's free to sign up to Sly Fox Shopper, and simple to get started. Just hit the Sign Up button at the bottom of the page to get going. If you want to know more, then take a look at our Frequently Asked Questions page. 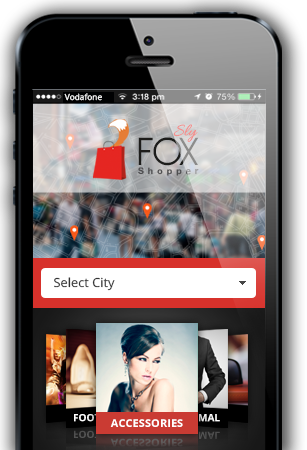 Attract customers into your store by listing your business in Sly Fox Shopper allowing potential customers to easily find you while out shopping in your area. Make your customers aware of all your offers and promotions by displaying them directly on shopper's mobile phones while they are out shopping in your town. Guide customers directly to your store by displaying your exact location on interactive maps along with the shopper's location and showing the exact distance to your store. Copyright © 2019 Ridgeway Technology Ltd. All rights reserved.